Before leaving Australia, I still had a couple of days left to explore more of this beautiful continent. I knew I was going to be back in the future to see more for sure. I still hadn’t been to the west coast and places like Perth, Melbourne, and Adelaide. But for now, I was going to meet a friend in Sydney and would get the chance to explore Sydney City. She is Chinese and I met her during my exchange semester in Copenhagen. Trying to find her I got a bit lost in the city center of Sydney walking around packed with my stuff in the hot sun. My friend worked at the ‘Queen Victoria Building’ which is a cute old but also fancy building. I felt a bit out of place when entering all sweaty with my big bag pack. When I asked for my friend at the store where she worked I couldn’t even turn around with my big bag so I walked in and walked back without turning trying to not touch any of the expensive handbags…the whole time I was watched by the girls in their spotless pencil skirts and high heels. I finally met my friend. After storing my bag in a storage room, I hit town and spend the whole day walking along the water starting from Darling Harbor and crossing the Sydney Harbor Bridge on my way to the Opera House. If you feel like taking a long walk away from the busy streets take this walk along the water line. You can grab water and ice cream on the way and rest in between under the trees reading a book and enjoying the fresh breeze. My friend lived in a student-housing complex which was interesting to see to get a feeling for the Australian student vibe. Back in Copenhagen, we hadn’t even been the closest friends. It just took a steak and a glass of wine for us to immediately delve into each other’s deepest thoughts. Those are the situations while traveling that are just priceless: How you can end up chatting to people about life as if they were your closest friends. When you’re open to it life will offer you the most random and most awesome get-togethers. For my second day, I was going to explore Sydney City more and make my way to Bondi Beach which can easily be reached by bus. Later, I wanted to get to Sydney City Center later…well, that didn’t happen! I had way too much fun sitting on a hill overlooking Bondi eating a double chocolate Oreo Cake from a local store after having already finished my big FroYo. Something I really spent money on throughout my travels: FroYos. Please, Germany, it’s time to open a self-serving FroYo store: I want to be able to go wild and add whatever I like and however much I like. In Germany, someone else does that job for you (‘That’s not enough oreo cookies for the topping, more more more’). 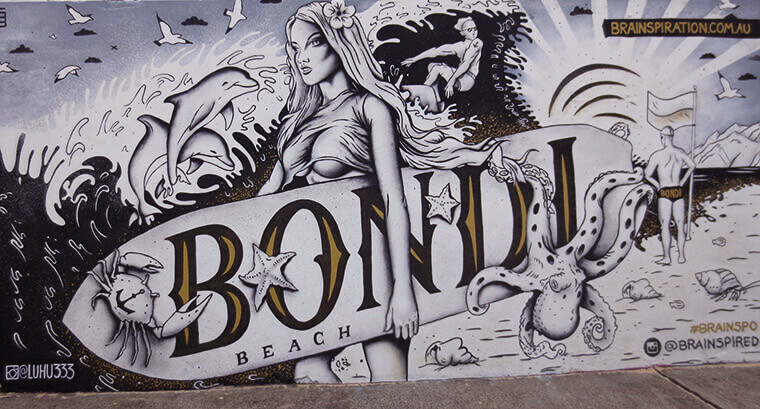 I had such a great relaxing day at Bondi. An older couple happily commented how great it was that I was still taking the effort to write ‘old-fashion’ postcards home. Those are the moments that put a big warm smile on my face! When in Australia, for all the girls, go to Peter Alexander: it’s the Australian Victoria’s Secret and the stores are super cute. Another tip if you want to enjoy the view around Sydney Harbor: don’t go to one of the obvious (expensive!) choices like Sydney Tower. Instead, go to a skyline bar like the ‘O-Bar’ and watch the harbor while the platform is constantly rotating, pay no entrance fee and simply spent the money on a nice drink, et voilà. Also, try one of Sydney’s best Sushi at ‘Makoto City’ at the Worldsquare. It’s a bit hidden but my friend said it’s her favorite. Thanks to my friend, I got the perfect taste of her life in Sydney. Well, I almost would have been forced to stay longer but luckily realized in time that my departure flight wasn’t at 8 pm but 8 am. Puh! Bye Sydney! Bye Australia…for now!